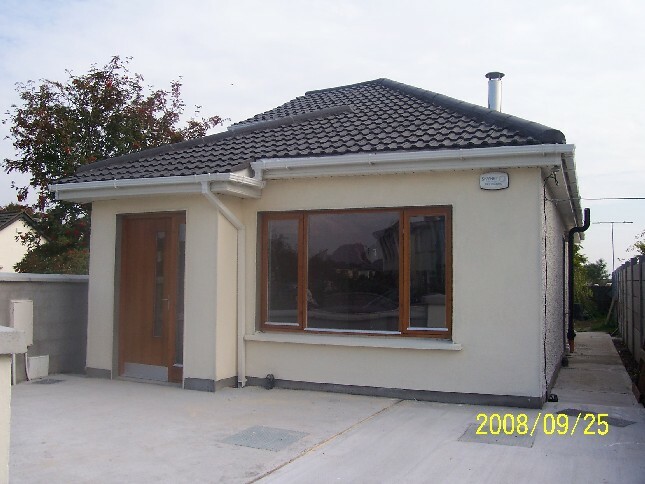 Project: Detached dormer bungalow in Dublin 20 Date: 2007 - 2008 Job Description: Design & Planning Services, Construction Management. Our clients had a small trapezoidal site at side of their existing dwelling in Dublin 20. They were willing to build a small detached 1 bedroom dormer bungalow at this location. They were looking for a modern and functional design with a good storage capacity and a wood burning stove in the living area. Answering to our clients' brief, we proposed a trapezoidal layout which follows the existing boundary. The bedroom is located at rear where the width is restricted. 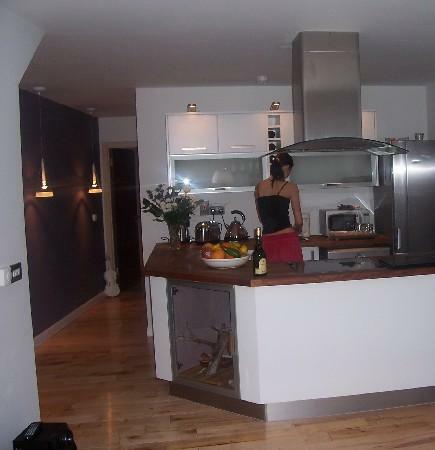 A large dining/kitchen/living area is located at front of the dwelling. The bathroom is located at side and includes a beautiful stain glass window. 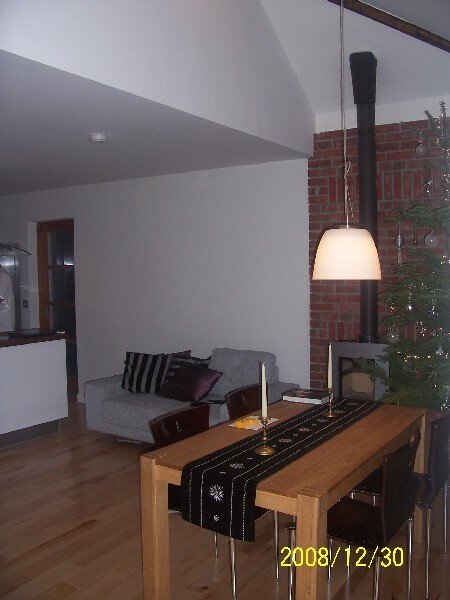 We have proposed a brick wall behind the stove to act as a thermal mass to preserve the heat produced by the appliance. The first floor is a store room/study with restricted headroom due to planning constraints. All the ground floor includes an under floor heating system above a suspended pre-cast concrete slab. Edi Kivimae was appointed by the clients for all the interior design and she successfully dealt with this dwelling which was her first built project. The clients used our services for construction management. A large and deep sewer pipe in the vicinity of the site created major digging work as we needed to lay the foundations 3 metres below ground level because piling foundations were ruled out by the local authorities. Trenches of this depth within a narrow site like this one represented major added cost for a small dwelling. However, we were aware of this problem from the design stage and the clients were informed about this issue long before construction started. The dwelling was insulated as a class B2 for energy rating but no renewable energy source was installed. However, thanks to the under-floor heating system, the clients have the option to replace easily their existing gas boiler by an air/water heat pump, if they are interested to do so in the future.